Shop at Kmart for some holiday tabletop decorations...and don't spend more than $100.00. Oh, yes. This was EXACTLY what I needed to get my rear in gear! Over the years, our tree has taken on a sort-of rustic, outdoorsy-but-still-pretty feel...a lot of red, plaid, gold, pinecones, etc. so I decided I really wanted to stick with this theme...at least throughout the living & dining rooms. I'm really starting to dig these white trees...maybe next year? And look at those fun cookie & cupcake ornaments!!! 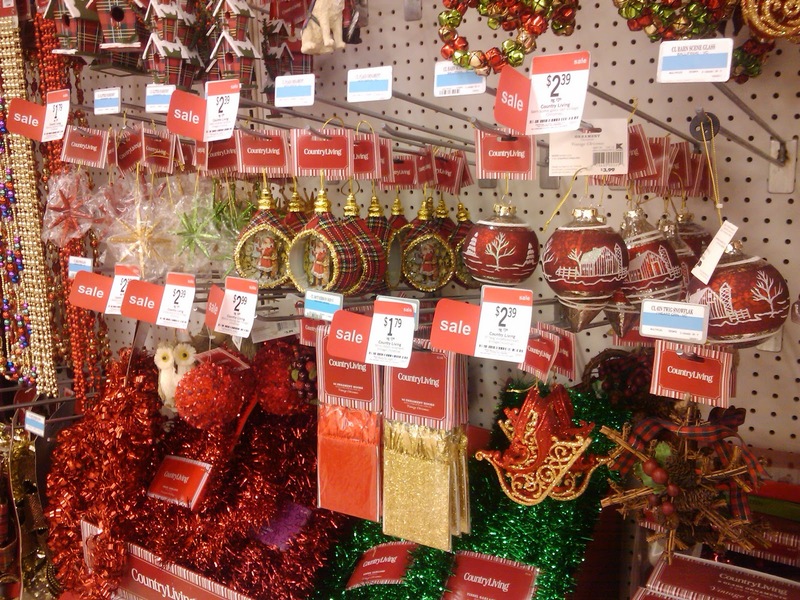 I had no idea Kmart had such a huge holiday decorating selection! I honestly thought I would have a hard time with this challenge, but no, just the opposite...I had a hard time not buying one of everything! And guess what? With all of the amazing sales that are going on right now, I spent less than my alloted $100.00...woo hoo! 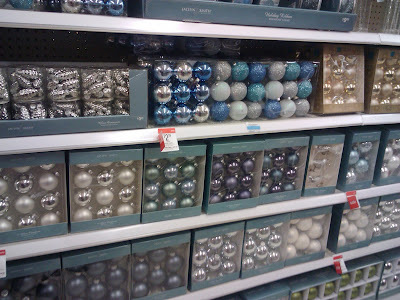 Wanna see what I did with all of my wonderful new decorations? I love the turquoise with the orange & red & pink...so festive! Now...finally...our dining room table. This is always the spot I have a tough time decorating...I'm never quite sure if I'm doing it right...I already had a couple of outdoorsy-looking trees (aka jute-covered styrofoam cones) on the table...but that was it. Boring. 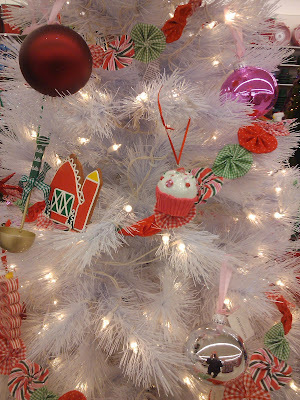 I've seen little mini Christmas trees in ornaments all over blogland...I think they're so adorable. So I took a couple of the Lemax Village Collection mini pine trees that we bought and put them under glass...with some more of our "snow." I really just love this candle...and I can use the little sweater over and over again! Aaaand this decoration can stay out until spring! And here is the whole table...all put together...what do you think? Finally...I mentioned that I had bought some candy with my Kmart money...I always like to have little treats around to offer guests that visit during the holidays...not just a piece, but a little box of something to take home...a little gift. What do you think? 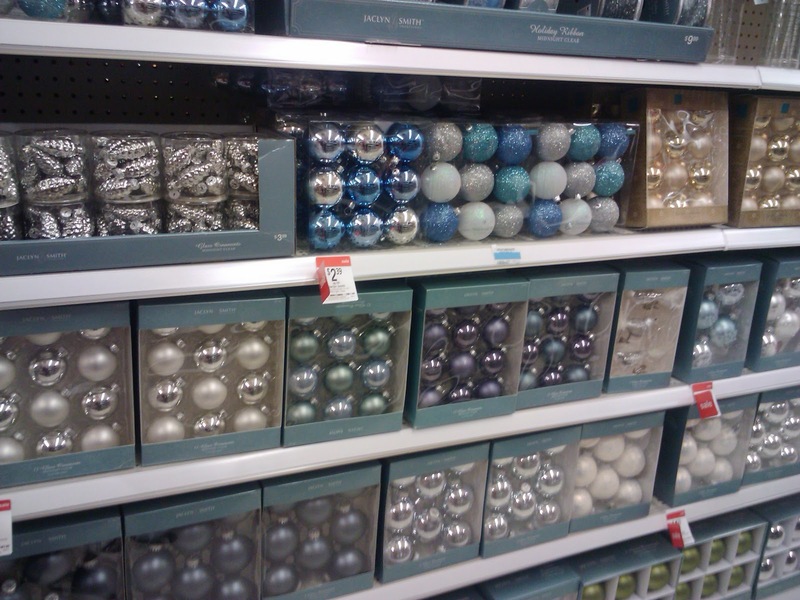 Have you finished decorating yet? Have you even started? Do you do a theme throughout your house? Or room by room? Or is everything just random? Do you change your decorations every year? Or stick with the same things? Can you believe Christmas is only 9 days away? While I have been compensated for this post, all opinions are 100% mine. Lovely Maggie! I especially like the wreaths on the chairs. So beautiful! I love everything you bought! I need to check out KMart for sure! PS Your blog looks gorgeous! You did a great job! Love all the little touches. The tree in the kitchen is beautiful. Sorry, I was typing too fast! What I meant to say, is that it all looks so beautiful! I can't even pick one thing as my favorite! You found some GREAT stuff! I just love the tree in the colander with clementines ... awesome! Maggie I love your ideas... it all looks so cool... BUT I am kind of miss seeing Obama thrown in the tree!! :) Happy Holidays and thanks for sharing all your great ideas!!! All the details are perfect, I love the colander tree in your kitchen so much!!! Great photos too as always!! All of your touches are simply fantastic! What a wonderful eye you have! Thank you for sharing your vision and special touch in decor!